So it’s one month before the big day! Hopefully you followed the tips from our last blog and you are already well on your way to enjoying a successful move. But it’s no time to let up now. Here is a checklist for moving one month before you move. Look fun? Yeah, I didn’t think so either. We have all gone to our mailbox and found letters and magazine subscriptions addressed to the old tenant. Don’t let this happen to you! Be sure to let everyone, including your post office, bank, publications you subscribe to, and insurance and credit card companies know that you are changing addresses. That way, your house’s new tenant won’t have to be stuck reading your subscription to Cute Baby Penguins Magazine (we promise we won’t tell anyone). You can get the address change form from the US Postal Service here. 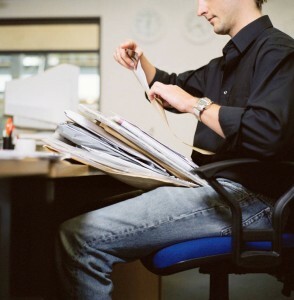 Getting your utilities changed over is an often overlooked step in the moving process. No one wants to come home to their new house only to find you can’t have a glass of water or turn on the AC (especially if you plan to move this summer. Yikes!) Be sure to contact all your utility, cable, phone, and internet providers and arrange to get everything switched to your new address. This might also be a good time to shop around and see if you can save some money by switching companies. As you go through your checklist for moving 4 weeks before the move, it’s a good idea to pack everything you possibly can. You have a lot more stuff than you realize, so unless there is just no way you can live without it for a month, pack it! Don’t forget to be labeling each box as you are packing so you can actually find your things when it’s time to unpack. Read our last blog as a cautionary tale! The Container Store makes a great set of color-coded packing labels that correspond to each room. Summer is the busiest time of the year for moving, so if you haven’t chosen your moving company, go ahead and get that taken care of. There are dozens of Dallas moving companies, some great and some terrible. Moving is a hectic time, so having the peace of mind that your possessions will get to their destination on time and in perfect condition will make for a smoother move. 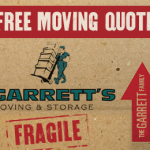 Garrett’s Moving and Storage has 20 years of experience in moving to Dallas and across the country, and we have an A+ BBB Rating so you know your belongings will be in good hands. Contact us today at 972-487-5843 for a free estimate or click here to request a quote online. Keep a lookout for our next blog from the premier Moving and Storage Dallas company, which will be discussing what you need to do 2 weeks before moving to Dallas. This entry was posted in Stress Free Moving Tips and tagged Dallas Moving Companies, Moving and Storage Dallas, Moving Companies in Dallas, Moving Tips. Bookmark the permalink.